David Fernández-Llorca received the MSc and PhD degrees in telecommunications engineering from the University of Alcalá (UAH), Madrid (Spain), in 2003 and 2008 respectively. At present he is Full Professor at the Computer Engineering Department at the UAH, and a member of the INVETT research group. His research interests are mainly focused on computer vision, intelligent and autonomous vehicles, and intelligent transportation systems. He is currently Vice-Director, Director of International & Companies Relations and Director of Internship Programs of the Polytechnic School at the UAH. He was the Head of the Systems Engineering and Automation Teaching Area from 2012-2018. He was Vice-Director of the Computer Engineering Department at the UAH from 2012-2017. He is the author of more than 110 refereed papers in international journals and conferences and co-inventor of more than 12 patents including Surewash system. 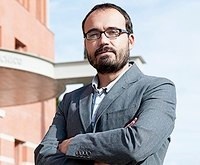 He has been recipient of the IEEE ITS Society Young Researcher Award 2018 (researchers under 40), the Young Research Medal of the Real Academía de Ingeniería (researchers under 40), the Social Transfer Council Award 2018, the Best National Patent Award and PCT Extension 2017, the Prize for the Best Team with Full Automation of GCDC 2016, the 2013 IEEE ITSS Outstanding Application Award, the Best Young Researcher Award from UAH in 2013, the Best PhD Award by the UAH in 2008, the Best Research Award in the domain of Automotive and Vehicle Applications in Spain in 2008, the 3M Foundation Awards under the category of eSafety in 2009, the Master Thesis Award in eSafety from ADA Lectureship at the Technical University of Madrid in 2004, and the Best Telecommunication Engineering Student Award by IVECO in 2004. Dr. Fernández-Llorca is currently Associate Editor of the IEEE Transactions on Intelligent Transportation Systems and Journal of Advanced Transportation, and he has served on Program/Organizing Commitees in more than 15 international conferences. Between 2005 and 2006 he was research visitor at the School of Computer Science and Statistics, at Trinity College Dublin under the supervision of Dr. Gerard Lacey. In 2008 he was research visitor at the Department of Environment Perception at Daimler Research and Development, under the supervision of Dr. Dariu Gavrila. Since 2009, he is co-founder of Vision Safety Technologies Ltd, a spin-off company established to commercialize computer vision systems for road infrastructure inspection.